Almost two years ago, I wrote a post about the situation of "Data Scientist" and "Artificial Intelligence" at that time. After two years have passed, now what's happening and what do we see? Below is a summary of current situation of data science, data scientist, artificial intelligence and related topics in Japan. AI was already a rising star even two years ago. Now it's no longer "rising" star; really a super star. This result of Google Trends describes the situation very well. 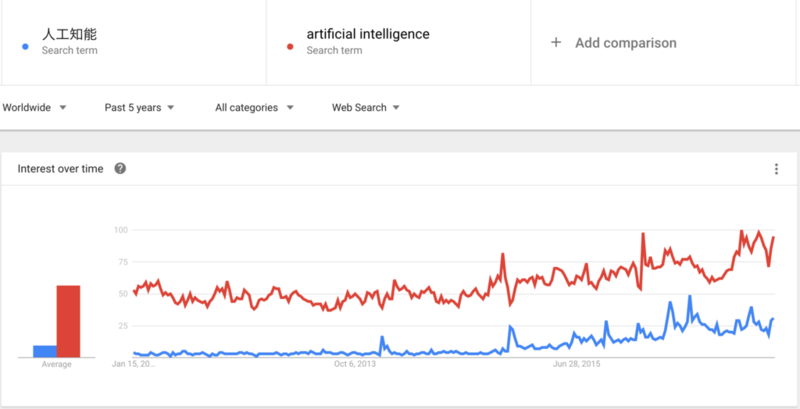 In these two years, AI has been growing more and more with several spikes and continuously rising trend. This plot clearly shows that people in Japan are getting to be more enthusiastic AI. Google News with a keyword "人工知能" (AI in Japanese) now returns 163,000 news articles. Now we Japanese are seeing that a word "AI" dominates everything - even "AI" was nominated as "the most popular keyword in the 2016". After a lot of media coverage about a certain AI product for Go board game, media coverage, books or internet news articles rapidly increased. Even some committees in the Diet got to argue on how the government should treat AIs and how the society should develop and manage AIs, although either "Data Scientist" or "Big Data" did not cause such controversies. What is really going on behind the boom? 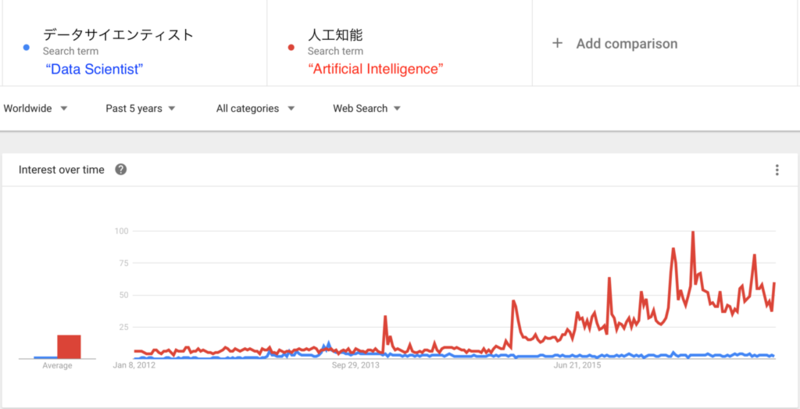 A Google Trends above clearly shows that a growing trend of "人工知能" (AI in Japanese) is steeper than that of "artificial intelligence" in English. You can see how the current boom of "AI" in Japan is right now. But what is really going on behind such a boom? I know that some really make sense, but others appears just fake or fools. Currently the word "AI" can attract more and more people, money, or even reputation. Some greedy people love to add the word "AI" to everything in order to earn more revenue than their own true value. Actually, some of "AI" products released from major companies in Japan appear quite misleading. Some are rule-based, some of others are based on usual decision trees or linear regression, and the other is based on NN with just a single hidden layer*1. Even such a kind of questionable products call themselves as "General Artificial Intelligence" and major newspapers in Japan reported it as so. Wait, does the word "General" mean what??? Is it really identical to Strong AI??? Of course not a few academic researchers, including university professors, are raising a concern about such an overheated boom of "AI" with too many questionable products or media coverage. However, people and the society appear to leave such a concern and to rush into further flaming chaos of "AI" in Japan. Now people are thinking that without any "AI", it cannot be called technological. We have seen too many TVCM saying "our product is empowered by artificial intelligence" but not saying what kind of AI is used for it. On the other hand, "Data Scientist" is to get forgotten by the society. Some people may ask me whether it is real or not, and I would say "yeah it's just a kind of joke or analogy". Are they really getting forgotten? In reality, attention to data scientist by the society have been kept at a low level. This plot of Google Trends describes the situation very well. In English (precisely in the countries whose official language is English), "Data Scientist" has been kept still growing even after "AI" arose. However, in Japan, it has been stable at a low level after a prominent peak in 2013. Interestingly, data scientist seems to be distinguished from "Machine Learning / Artificial Intelligence Engineer". Through a past big and overheated boom, Japanese people are now considering "Data Scientist" as a "phantom job", which means that it's not real but imaginary job. The reason is not clear, but maybe because people cannot find almost no good candidates for data scientist in the actual world, outside books or media coverage which claims "Data Scientist is the sexiest job in the 21st century". Now it's an era of "AI", dominated by machine learning engineers, not data scientists, as Japanese people think. Indeed there are a lot of recruitment of machine learning / AI engineers across almost all industries, but that of data scientist got to be very rare. As opposed to such a tide, some universities or colleges in Japan are establishing courses or even schools to produce future data scientists. 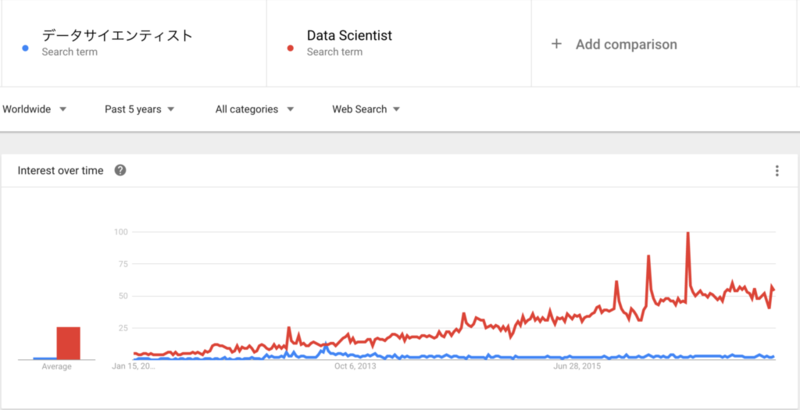 Despite such a movement, Japanese people look no longer interested in data scientist.